Oh, boy. This is a huge undertaking and takes lots of careful planning and perhaps a bit of diplomacy! It’s important to help them reduce as many physical demands in their environment as they age, like removing clunky furniture, reducing trip hazards and improving lighting. But, it’s also critical that you help them to reduce their mental strain as well. Sorting through files, streamlining access to important information and reducing the clutter of paperwork (bills, investment records, etc.) is helpful too. Does your parent have a problem with letting things go that borders on hoarding? If the issue causes arguments within the family, there may be a serious problem. 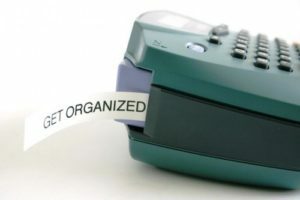 To keep peace and harmony, you might look into a professional organizer. They can act as a buffer and they know how to make the experience a positive one. Step One: Take stock. Assess your parent’s situation and put a plan together. Go through their home and identify potential problems. Is their attic, basement and/or garage overstuffed? Are their kitchen cabinets or pantry filled with expired cans of food? Caution – keep your judgements to yourself. Even if your parent is driving you insane, try to be as accommodating as possible. Resist the temptation to just start throwing stuff away or forcing him/her to make decisions they are reluctant to make. For more information about emergency preparedness for seniors, check out the Red Cross website. “Keep Until I Die” for items with sentimental value like true family heirlooms, personal letters, photo and scrapbook albums and wedding china. “Appraise and Sell” for unwanted items of value. “Keep with Me” for unsentimental items like furniture and art. “Garage Sale/Donate” for unwanted items. Step Four: Take it slow if you have the luxury of time. Unless you are challenged by a tight deadline like a serious illness or moving date, the process should be an ongoing one over a period of weeks or months. Not in a day or over a long weekend. Sorting, cleaning and eliminating a lifetime of stuff is an emotional exercise and can easily overwhelm everyone involved. Step Five: When all else fails, call an expert. Craigslist, TaskRabbit and services like Home Helpers can assist. They are a great resource if you live far away from your parents and want to make sure they get the help needed.